We have many lessons about these creatures, and there is still a lot of lessons about dragons ahead. 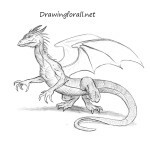 In this tutorial we will show how to draw a classic dragon step by step. Let’s start with the skeleton, sketching out first the head and the long line of the spine. After that, we sketch a thorax and pelvis. 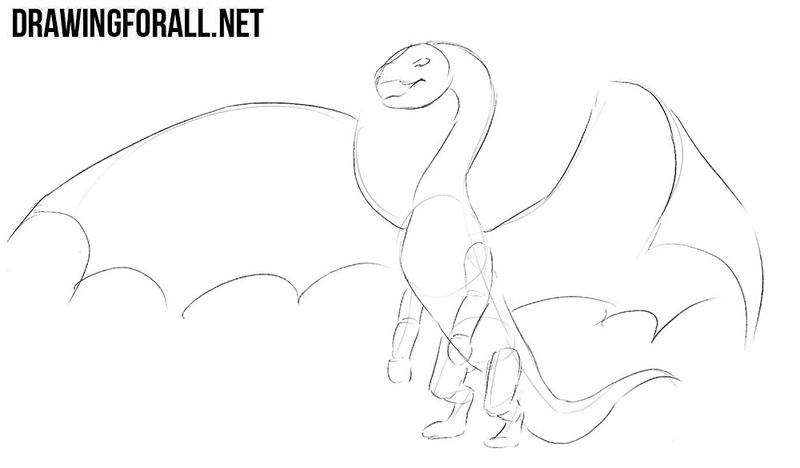 Simple lines will help us to sketch out the arms, legs and large wings. Outline the terrible mouth and evil eyes. Next, we outline a long and curved neck, moving into the torso and tail. 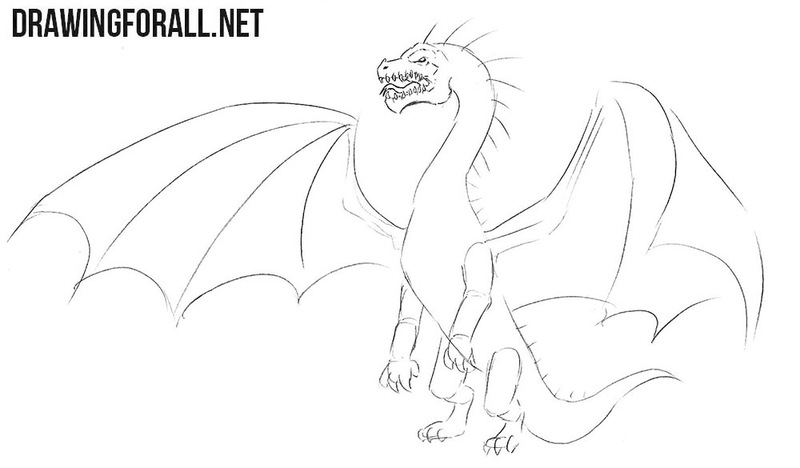 Next, using simple geometric shapes, we outline the arms, legs, and wings of the dragon. 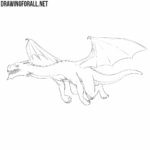 Let’s add some basic details to the dragon’s body. Outline the contours of the heads and thorns on the spine. Next we sketch out long lines on the wings and sharp claws on the legs and arms of the dragon. 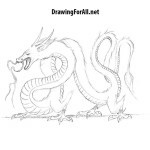 Starting from this step, we will add the details to the dragon drawing. Using clear and dark lines, gently draw out the large mouth with sharp teeth and protruding tongue. Next we sketch out the outlines of the head, draw the eyes and erase the guidelines. Now let’s get to the work with the details of the neck of our creepy dragon. Continuing the lines of the head gently draw the outlines of neck. Next, draw a large comb on the neck and draw transverse lines on the monster’s neck. Continuing the neck lines gently draw out the outlines of the dragon’s torso. 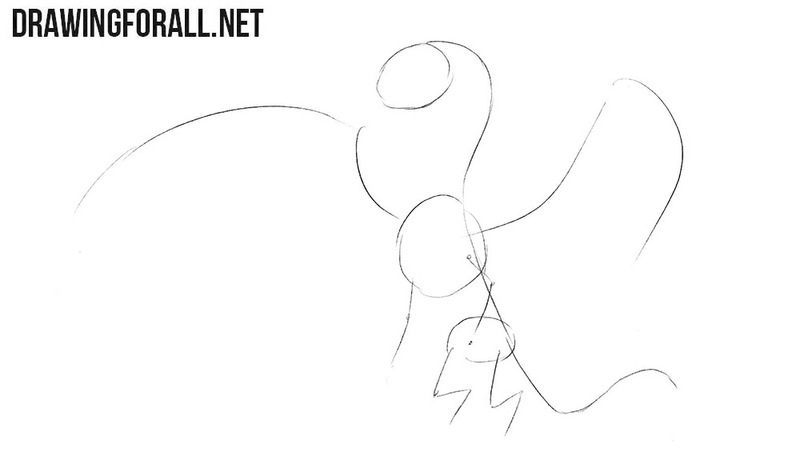 Next, draw the arms, which should be very similar to the arms of a sports man. 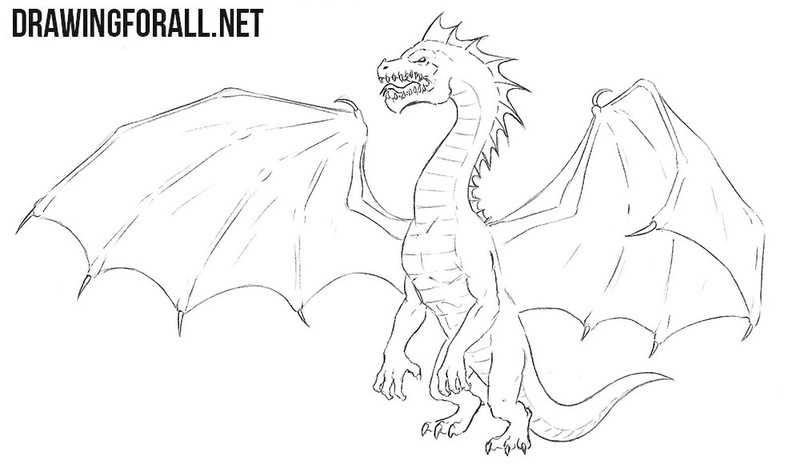 Draw hands with sharp claws and remove the guidelines from the upper part of the dragon’s body. Now let’s move to the lower part of the dragon’s body. Continuing the lines of the torso we draw out the legs that are more like the legs of a crocodile or another reptile. 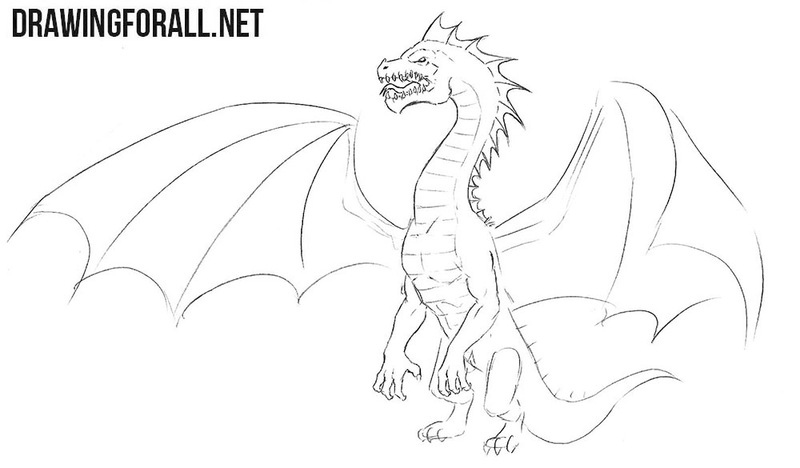 Next, draw our the long tail and delete unnecessary lines from the lower body of the dragon. 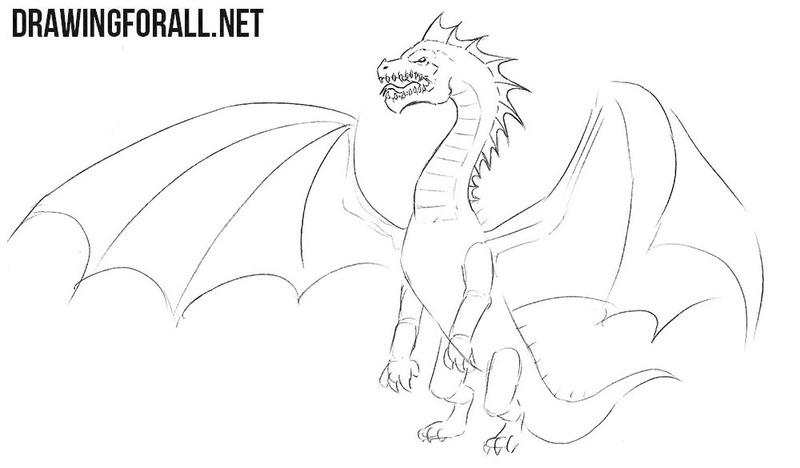 In this step, we will essentially need to finish drawing the dragon’s body. Gently circle all the lines of the wings of the dragon, considering all the joints of our ancient monster. With the help of an eraser we delete all the unnecessary guidelines and proceed to drawing the shadows. So, the drawing of a dragon is almost complete, and we just have to draw some shadows. So first of all let’s define the light source. Then, using hatching, add shadows to those areas of the dragon’s body where the light does not fall. 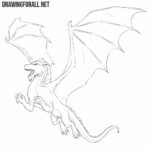 The drawing of the dragon was quite complicated, but we hope that all our readers were able to cope with this tutorial, and now know how to draw a dragon step by step. But this is not the only dragon on our site, and to see others go to our category called Myths and Legends.